On the shores of Lake Victoria sits the city of Jinja, a population hub poised to explode with economic activity. The site of a potential second beanstalk to the stars, the burgeoning city has attracted an army of workers. But what secrets does the city of Jinja hold? What threads of truth can be found down the White Nile? Find out today! 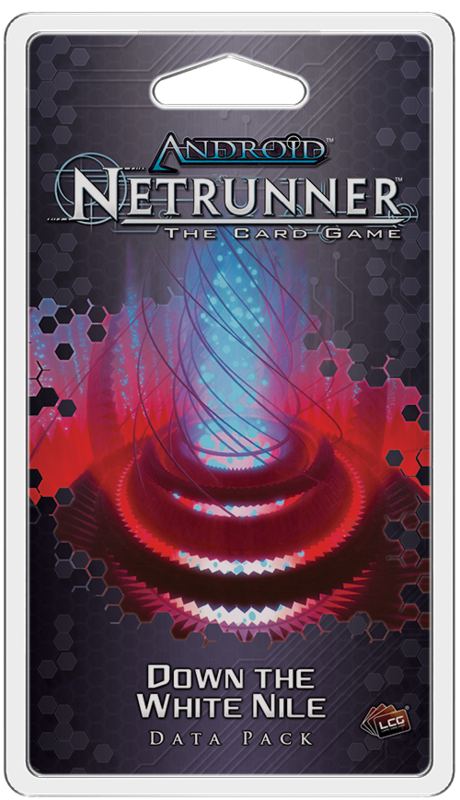 Down the White Nile, the second Data Pack in the Kitara Cycle for Android: Netrunner is available now from your local retailer or online through our website! 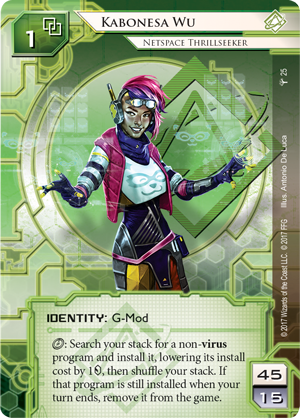 This Data Pack introduces a daring new Shaper identity, viruses to propagate chaos, new tools for the corp that punishes runners for invading their servers, and the ultimate way to distract the masses. Kabonesa Wu (Down the White Nile, 25) lives to challenge herself—there is no task she views as too big, and no dare that she won’t take. She invents and cracks, phishes and runs to prove to herself that she can, and only feels alive when she's taking a risk. Wu runs with a skill nearly unmatched in the world of Android. At the cost of a click, you may search your stack for any non-virus program and install it at a discounted price. Then, at the end of a turn, if that program is still in play, you remove it from the game. While this prevents you from recurring programs fetched by Kabonesa Wu from your heap, there are ways around the restriction. 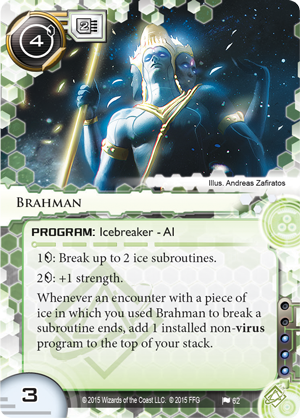 For example, you could even use a deck focusing on the powerful Brahman (Salsette Island, 62) breaker with Kabonesa Wu. 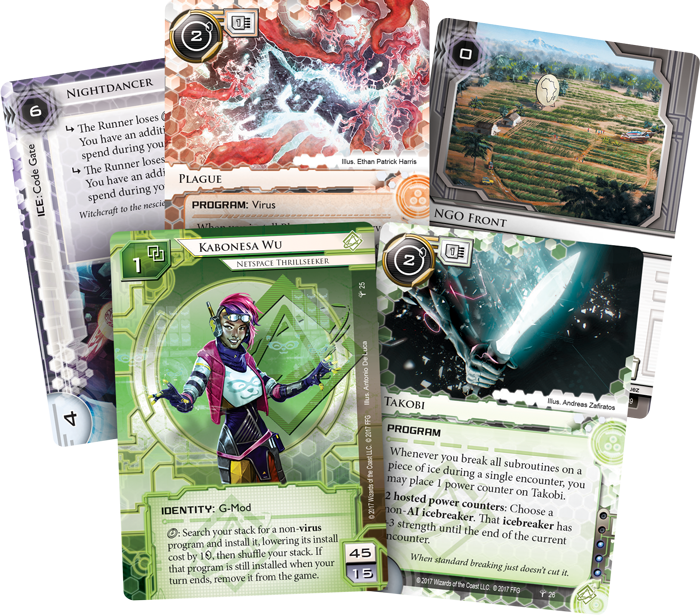 Returning the programs you install with Kabonesa to the top of your deck will prevent them from being removed from the game, provide fuel for Brahman, and ensure they return to your hand the next time you draw a card or use your knowledge to take advantage of Oracle May (Honor and Profit, 54). 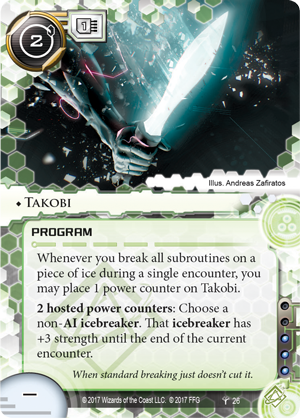 Also found in Down the White Nile is a powerful new Shaper tool that will boost their already substantial icebreakers: Takobi (Down the White Nile, 26) Whenever you break all subroutines on a piece of ice during a single encounter, you may put a power counter on Takobi. Two of these power counters from Takobi lets you give a non-AI icebreaker plus three strength. Shapers are the most traditional of the runner factions, and commonly break subroutines. Takobi simply rewards you for something you'll already be doing by boosting the efficiency of your breakers. 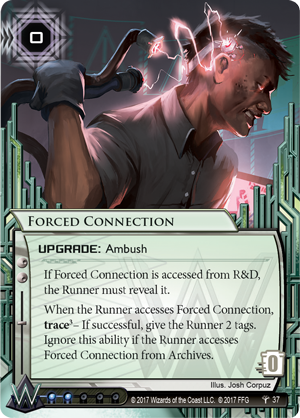 Of course, the corporations of Android: Netrunner receive new powerful tools as well. 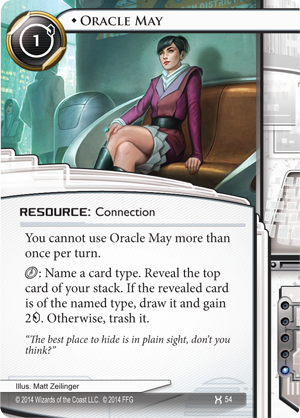 In Down the White Nile, these tools take the form of cards that can punish runners for making successful runs and accessing cards. The Weyland Consortium is known for using their vast resources for retribution and vengeance against those who have wronged them. Running on Weyland’s servers is inviting disaster to strike when you least expect it. This can often take the form of meat damage thanks to an unfortunate Traffic Accident (Order and Chaos, 22) or a Punitive Counterstrike (Revised Core Set, 122). However, they also aren’t above hitting you where it really hurts—your finances. Economic Warfare (Down the White Nile, 36) forces the runner to lose four credits if they made a successful run last turn. This is an operation that truly shines in the midgame. 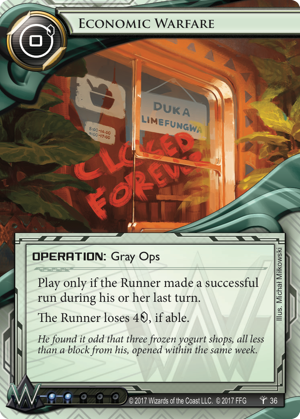 When making a successful run is already costly for the runner, playing a well-timed Economic Warfare can further decrease their credit pool, setting Weyland up for the aforementioned Punitive Counterstrike. Of course, that’s assuming the runner didn’t already find a nasty surprise waiting for them at the end of their run. Forced Connection (Down the White Nile, 37) is an ambush that triggers a strength-three trace when it's accessed. 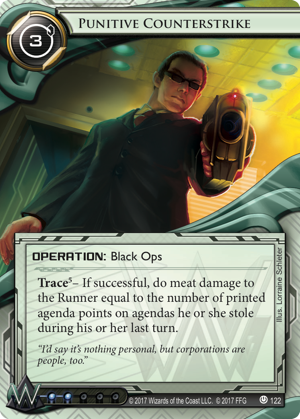 If the trace is successful, the runner will receive two tags. 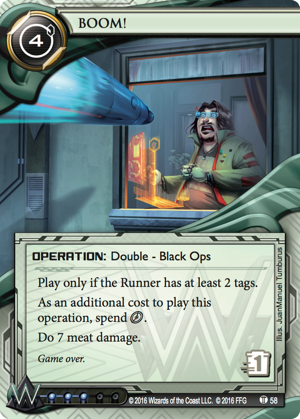 Weyland is always looking to stick tags on the runner, and two is the perfect number of tags for a BOOM! (Escalation, 58), which can end a game real fast. Running into a Forced Connection immediately re-prioritizes the runner’s turn, as they will likely use their remaining clicks and credits to get rid of tags. As Weyland looks to the future of the SSL, they remain as vindictive and frightening as ever. 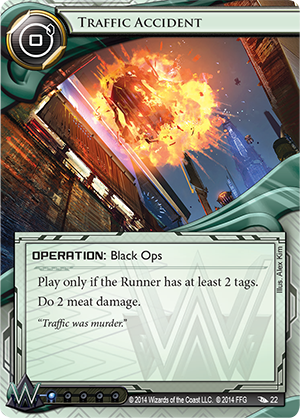 Though runners continually develop ways to get through the corporation’s servers, further advancements on the corp side will have them questioning if they even want to break through the defenses. What path will you choose with your decks? Explore the depths of the Sub-Saharan League with Down the White Nile (ADN51), available now from your local retailer or our website!